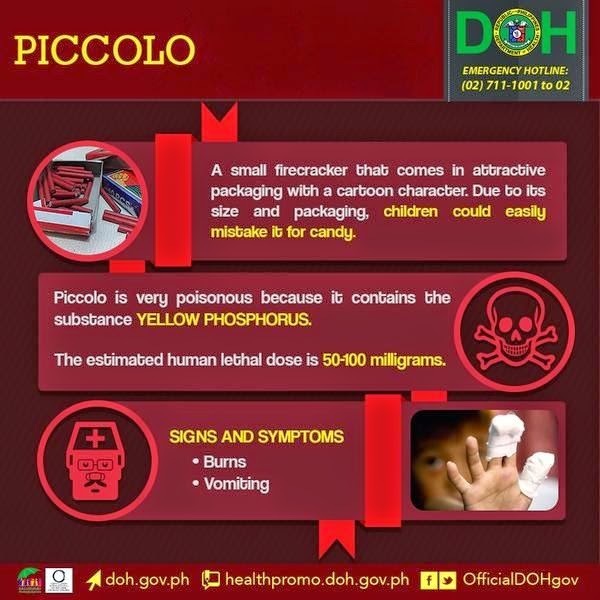 MANILA, Philippines - The Department of Health (DOH) today reiterated its call not to let children play with fireworks during the holiday season as latest data revealed that 67 percent of all fireworks injuries from December 21-29, 2014 were caused by piccolo. Piccolo, a small firecracker that comes in attractive packaging is very poisonous because it contains yellow phosporous substance. From December 21-29 this year, there were 139 cases of fireworks-related injuries and one case of fireworks ingestion. This figure is 39% lower than the five-year average and 45% lower compared to the same period last year. No death was reported. Most (51) of the cases came from the National Capital Region, followed by Northern Mindanao (12), Davao Region (11), and Cagayan Valley (10). At the National Capital Region, Manila has the most number of cases (22), followed by Pasig (10). Las Piñas, Mandaluyong, and Pasay had three cases each. Of the 139 cases of fireworks injuries, 87% were males whose age ranged from 3-68 years. There were 51 cases (37%) children less than 10 years old and 102 (73%) were active users. The top causes of injuries were piccolo (67%), unknown firecrackers (6%), and five star, camara, and boga with 4% each. “We can celebrate the holiday season without fireworks. 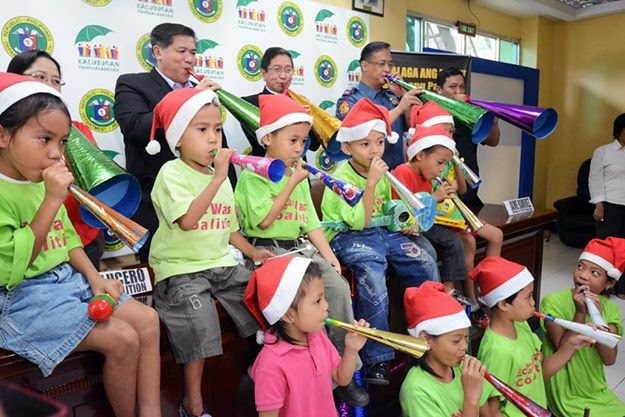 Let us greet the New Year without injuries,” Health Acting Secretary Janette Loreto-Garin said, adding that firecracker injury can be treated and eventually get healed but not the damage on our children’s future brought about by a few minutes of merry-making. “There are other means to celebrate than exploding firecrackers and lighting fireworks. Mahalaga ang buhay. It is not worth risking losing lives and limbs,” Loreto-Garin said, noting that DOH recorded 1,018 fireworks-related injuries during the 2013 holiday season.